Jim has served corporate boards and senior management teams for over 25 years in the areas of executive compensation, governance, performance-based pay and benefits. Meridian is the leading compensation advisor in the oil and gas industry. Jim leads a team of Texas-based consultants serving companies in the upstream, services, midstream and downstream segments of oil and gas. Jim’s clients cross a variety of industries, including the engineering and construction, transportation and consumer services sectors. Jim works with public and private organizations ranging from Fortune 100 companies to recent startups. Jim speaks frequently on compensation practices and governance strategies, including energy industry compensation and the alignment of compensation with performance in commodity-based businesses. 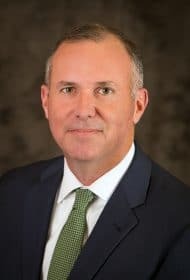 Jim serves on the advisory board of the Texas Tri-Cities chapter of the National Association of Corporate Directors, and on the board of the Montgomery County Food Bank.